Showing one's dancing prowess is one of the many ways to show one's self expression. Unfortunately, for some valid reasons such as aging and lifestyle affects us which lead to discomforts such as numbness, tingling sensations and worse, body pains. Pain in the hand, arms and legs caused by nerve damage is called Neuropathy which can make one feel numb, thereby making it difficult to function well. According to studies made, many Filipinos are afflicted with neuropathy as early as mid-20's but they do not receive proper treatment. 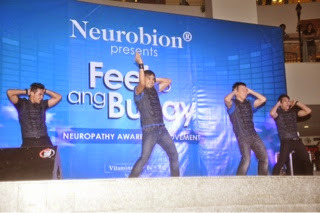 Merck Philippines recently launched Neurobion--this medicine can help prevent neuropathy's symptoms so that you can move freely again and enjoy life more. Neurobion reunited 90's favorite dancing icons such as Sexbombs, Universal Motion Dancers and Maneuvers in one afternoon of fun, exciting dance concert which truly delighted the crowd at the Trinoma Activity Center. Jopay Paguia lead the SexBomb dancers in a medley of their dance hits while actor Wowie De Guzman together with James Salas made the audience reminisce their Universal Motion Dancers (UMD) days by dancing to the beat of 90's most popular songs. Meanwhile, Gary Valenciano's favorite back up dancers, Maneuvers lead by Joshua Zamora showed off their dancing skills also with a medley of danceable bits that their group popularized. All these dancers know and understand the importance of being able to move freely without the threat of pain. Neuropathy includes pangangawit, pamamanhid and that tusok-tusok in the hands, arms and legs. Such body discomfort may make you feel helpless, out of control and miserable. But Neurobion is clinically proven safe and effective as it has the formulation that acts at the very root of these problems. 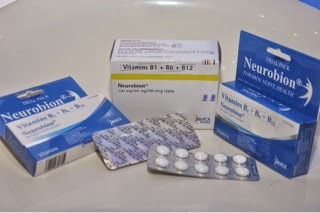 Each tablet of Neurobion can help maintain healthy nerves, promote nerve function and reduce pain in the arms, legs and hands caused by Neuropathy.